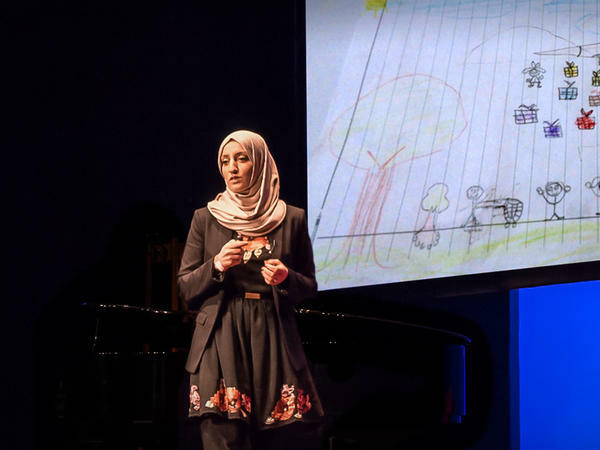 Aala El-Khani speaks on the TED stage. Dr. Aala El-Khani is a humanitarian psychologist, as well as a Research Associate at the University of Manchester Division of Psychology and Mental Health. Currently, she also works as a consultant for the United Nations Office on Drugs and Crime, where she develops and evaluates skills programs for families that have experienced conflict and displacement. So up until this point in the show, we've been focusing mostly on issues that parents face in affluent parts of the world - things like where to send your kids to school or are they getting the best math classes. But in the work she does, psychologist Aala El-Khani sees a whole different level of challenge. AALA EL-KHANI: I began visiting refugee camps in 2013 in Syria and in Turkey. I was interviewing mothers and conducting focus groups - asking them how they were coping and what parenting challenges they were facing. RAZ: Aala works as a consultant to the United Nations on programs that help families fleeing from war zones. EL-KHANI: Refugee children's mental health through war conflict and flight is really strongly influenced by the quality of relationships with parents and primary caregivers. But the challenges and stresses of war and displacement often affect parents' capacity to provide children with the care they need. RAZ: Today there are more than 20 million refugees in the world, the highest number since the Second World War. And Aala got involved with refugee work back in 2011, when she was a Ph.D. student in the U.K.
EL-KHANI: Yeah. At that time, in 2011, my children were 8 and 9. And I'm originally from Syria. My parents are Syrian. And as a family, as a community, we would kind of gather around the TV and watch these horrifying images of war, of people running, of children screaming and injured. And I began to wonder, as a mother, how do you cope when your children are with you in a warzone? I kept imagining myself in that context and how difficult it might be. RAZ: Aala picks up the story from the TED stage. EL-KHANI: We know that arming parents with skills in caring for their children can have a huge effect on their wellbeing. We call this parent training. So the question I had was, could parent training programs be useful for families while they were still in war zones or refugee camps? So I approached my Ph.D. supervisor, and then to my joy, she said, if that's what you want to do, let's find ways to see if parent programs can be useful for families in these contexts. So I traveled to refugee camps in Syria and in Turkey. And I sat with families, and I listened. They told me about the rough, harsh refugee camp conditions that made it hard to focus on anything but practical chores like collecting clean water. They told me how they watched their children withdraw - the sadness, depression, anger, bedwetting, thumb-sucking, fear of loud noises, fear of nightmares, terrifying, terrifying nightmares. These families had been through what we had been watching on the TV. The mothers, almost half of them were now widows of war, described how they felt they were coping so badly. They watched their children change, and they had no idea how to help them. They didn't know how to answer their children's questions. RAZ: When you talked to these parents, I mean, what were they doing? Like, how were they trying to protect their kids from, you know, from this trauma? EL-KHANI: Very often, the parents were still in survival mode. Their focus was on survival. I need to get to the end of today with my children alive without being harmed. And even when I interviewed them in refugee camps, when they were, you could say, relatively safe, they were almost still in the survival mode. It was so hard for them to shift back to their usual caring parenting. So that is why we became so heavily involved in developing resources for families that would inform them on how important their role was now more than ever in better caring for their children. RAZ: When we think about war and we think about refugees, we don't think of the knock-on effects, the sort of - the downstream effects of war. And really, those downstream effects are the effects that they have on children, right? I mean, it's those kids who are going to live another 50, 60, 70 years after this war and remember all those things. It's going to affect every part of their lives. EL-KHANI: We need to stop wars. But until we do stop wars, there is so much that we can do to weaken the link between war and psychological difficulties in children and their caregivers. But what we found was that parents were making active attempts at seeking support for their parenting in these refugee areas. And there was nothing, even doctors in refugee camps didn't have the capacity to spend time with caregivers to give them advice and support that they were looking for. EL-KHANI: So then we began to think. How could we help these families? The Syrian crisis made it clear how incredibly impossible it would be to reach families on an individual level. How would we reach families at a population level and low cost? After hours of speaking to NGO workers, one suggested a fantastic innovative idea of distributing parenting information leaflets via bread wrappers, bread wrappers that were being delivered to families in a conflict zone in Syria by humanitarian workers. So that's what we did. The bread wrappers haven't changed at all in their appearance except for the addition of two pieces of paper. One was a parenting information leaflet that had basic advice and information that normalized to the parent what they might be experiencing and what their child might be experiencing and information on how they could support themselves and their children, such as information like spending time talking to your child, showing them more affection, being more patient with your child. The other piece of paper was a feedback questionnaire. And, of course, there was a pen. We managed to distribute 3,000 of these in just one week. What was incredible was we had a 60 percent response rate. That kind of response rate is fantastic, really highlighting how important these kinds of messages were to families. The families had left hundreds of messages. My favorite has got to be - thank you for not forgetting about us and our children. RAZ: Aala, what have you learned as a parent, you know, raising two kids in an affluent Western country after seeing these kids in refugee camps? EL-KHANI: I've learned that every child matters. So a couple of months ago, I was in the West Bank, Palestine, and working on implementing a light-touch intervention for families that we had developed in Manchester with colleagues. I came back from the West Bank. And just days later, Manchester was shaken by the terrorist attack and the arena here in Manchester. EL-KHANI: I was talking to my neighbor, who was telling me about her friends who had a young daughter who had been at that concert. And her daughter was showing signs of being highly traumatized. She was terrified. She wasn't sleeping well. She was having nightmares. Then I got thinking. I thought, gosh, the experiences of this girl and her mother are so similar to the experiences of the families I was with just days earlier. So I shared the information that we had developed and implemented in Palestine with this mother. And days later, she called me, really emotional, and said, this has made such a difference to me and my daughter; I feel like I'm doing something right; I'm helping my daughter in the right way. So children can be protected by warm, secure parenting. I mean, this is the good news. When it comes to the very dark story of children and trauma, parenting is prevention. RAZ: Aala El-Khani - she's a humanitarian psychologist and research associate at the University of Manchester. You can see her entire talk at ted.com. Transcript provided by NPR, Copyright NPR.